What started out as a general chat between Alistair Coulstock and a friend of a colleague over a misunderstood concept is turning into a real live and exciting adventure. Professional members of the construction industry come together with UNSW students to design housing for under privileged families in Cambodia. Commencing July 2013 students of the UNSW course ’Sustainable Design and Energy in Developing Countries’ will be able to team up with professional architects from well known firms in Sydney. These teams, supported by team of professional engineers located in Australia and Cambodia will be set a brief – To design a house using local materials for Cambodian families in a village called Chom Trach. The Budget – $2,000 AUS. The houses will have to respond to the environment, cultural and spatial considerations, utilise local materials and meet the needs of the local people. A judging panel of representatives from the construction Industry, the University and Cambodian Royal University of Phnom Penh and Raw Impact, will select the shortlist of designs. Those who have been involved in the short listed winning designs will have an opportunity to join Troy Roberts of Raw Impact and his local team to help build their designs on the ground in Chom Trach. After a year of occupation by the families in Chom Trach, occupancy surveys will be carried out and the winning design chosen. The initiatives in the winning design will then be able to be incorporated in other housing projects in the local area. This is an amazing opportunity to bring the Construction Industry together with education for a great cause in a country of amazing beauty but incredible poverty. Funding for the course aspect of this experience is to be sourced via the industry. 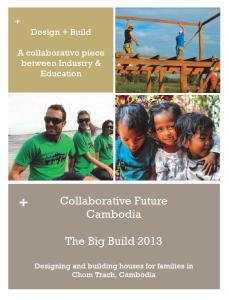 Please help this amazing initiative by contributing towards the build costs of the housing in Cambodia. Any donations large or small will make a huge difference to the families of Chom Trach. Thank you to Alistair for starting and committing to making real change in Chom Trach. Please contact Alistair Coulstock through via email ( a.coulstock@cundall.com.au ), facebook or go to the fundraising page.